This is an Aston Martin. What? The car that James Bond’s driving? That smallish vehicle? Well, we all dream of living like James Bond driving fast cars, going out with drop dead women, drinking vodka martinis (stirred, not shaken), killing all the bad guys, and always winning at the end, in a life that goes between luxury hotels, casinos and castles. But not even all Aston Martin owners live like this. Some Aston Martin owners live in Paris, or London, in an apartment with an underground garage 2 floors below street level. They drive at low speed in congested streets, often at rush hour. Not the best conditions to enjoy a 500 hp V12 supercar. There is some sense in a car that would bring the refinement of an Aston Martin in a package more appropriate to crowded european capitals. This might be it. It’s called the Cygnet, and the car is born as a Toyota Iq (not sold in the US at this time, but it may come later as a Scion). It’s a very compact automobile, only 3 meters long. Still, with a lot of engineering, Toyota has managed to make it feel surprisingly spacious inside, and it may sound incredible, but 4 people can fit in it. 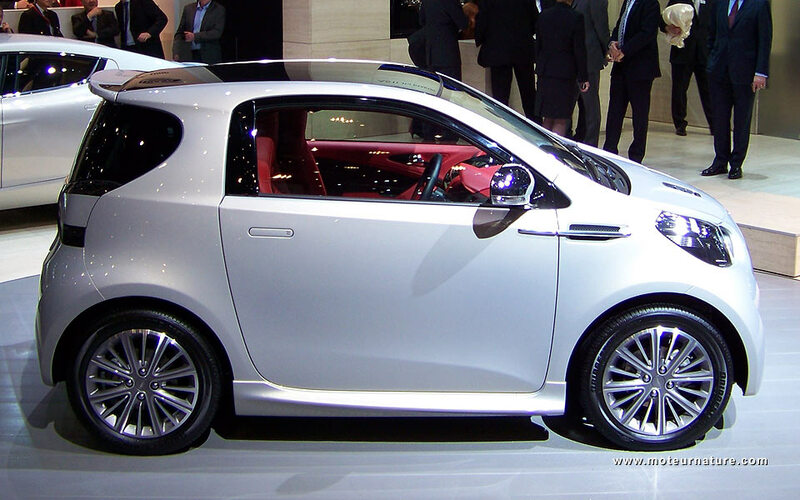 Actually, it has more space inside than a Vantage. Still, it’s best to use it as a 2-seater. 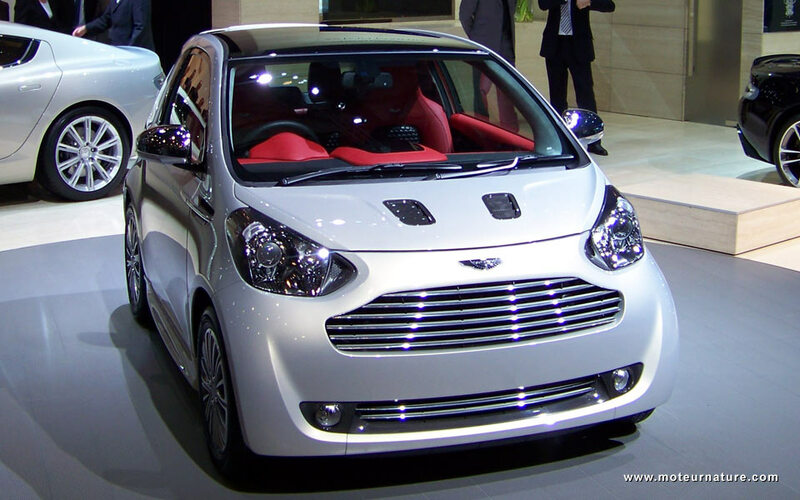 That way, it’s very confortable, and you will easily forget the car’s humble origin, since Aston Martin’s luxury is everywhere to be seen. The front grille is definitely the grille of an Aston Martin, and I’ve never seen leather this nice in any Lexus. The interior is second to none in terms of quality. Some owners might also enjoy the fuel economy that is very far from the british brand low standards, with ultra low CO2 emissions. 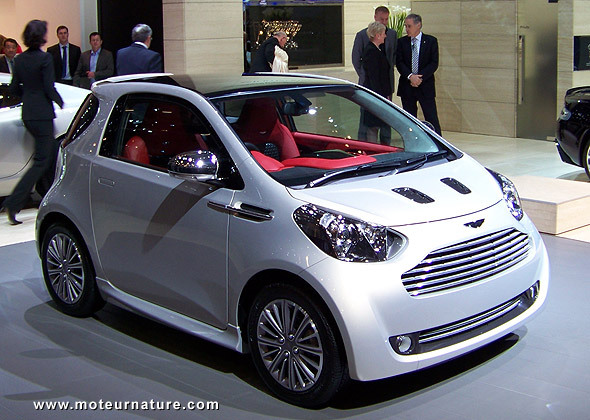 But at the Geneva motorshow, with the complete range of Aston Martin in front of me… Even to a green-minded guy like me, I couldn’t say that this very fuel efficient Aston Martin was the one I would choose over the superb sports car that were next to it. I guess people who already own an Aston Martin would not have that same feeling. The Cygnet for weekdays, and a DB9 for week-ends. Now, that’s something I could enjoy!